You are here: Home | How do I select a projector lens? How do I select a projector lens? You can use the Throw-to-Width ratio to determine the correct projector lens to select for your needs. 1. If your throw distance will never change, you can select a lens with a fixed Throw to Width Ratio. 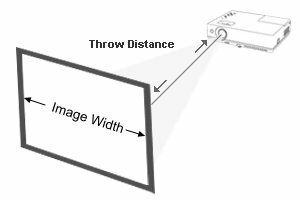 Divide the throw distance, from the front of the projector lens to the screen in inches, by the width of the screen in inches. Therefore, you would look for a lens that has a throw-to-width ratio of 1.25:1, (10' ÷ 8'):1. 2. If your screen width varies, select a lens that offers a Throw to Width range. Therefore, a projector with a lens that is 10' away from a screen and is capable of creating image sizes from 5' wide to 6' 8" wide, would have a throw-to-width ratio of 1.5-2 : 1, (10' ÷ 6' 8") to (10' ÷ 5'):1. 3. If both your throw distance and image size vary, select a lens that offers a Throw to Width range that meets your criteria. Therefore, if you criteria requires a throw distance from 8' to12' and an image size from 5' to 8', you would look for a lens that has a throw-to-width ratio from 1.5-1.6 : 1, (8' ÷ 5') to (12' ÷ 8'):1.